We made it! Finally the last day of the school year. 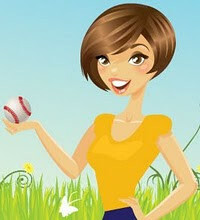 This week has been a crazy one filled with school parties, awards programs, talent shows, roof camp outs and field trips. Those 5th graders did it again and rocked the STARR science test! 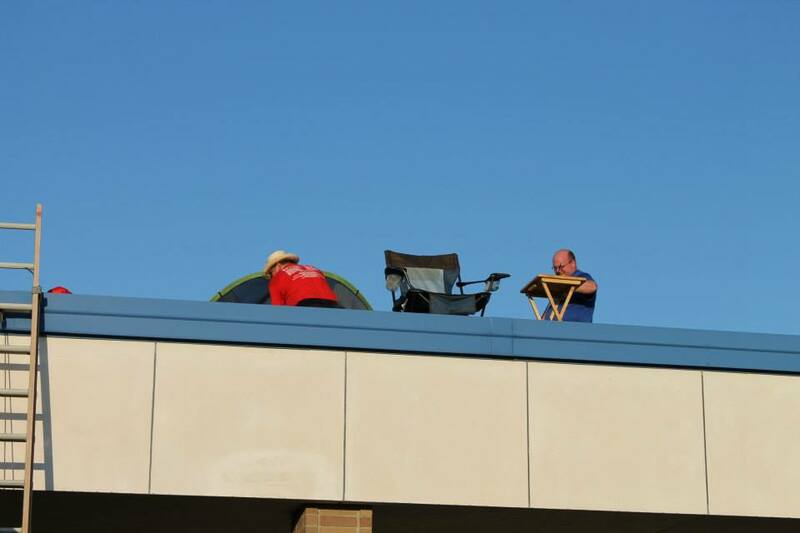 So Coach K and Coach J are sleeping on the roof TONIGHT! Come by and say hello, take a picture, bring them a snack, or honk when you drive by. 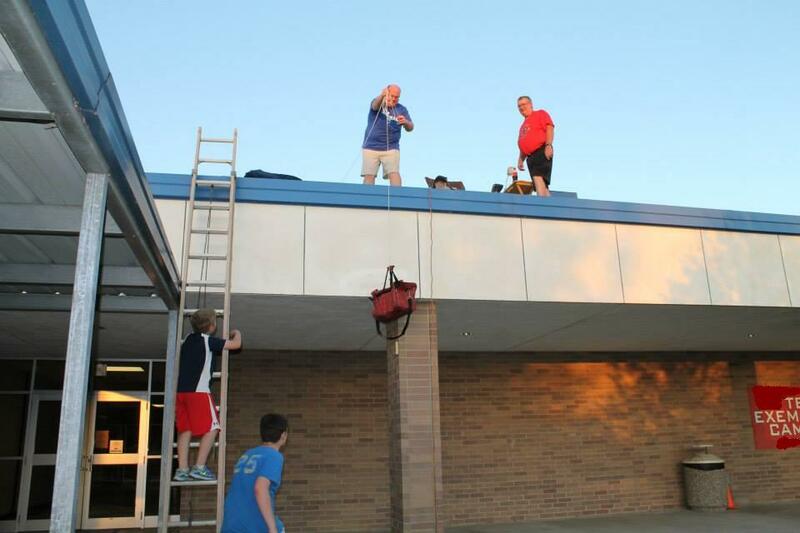 This will be the last year for Coach K to sleep on the roof as he is moving to the High School next year. So lets make this year a memorable one. And was it ever memorable. 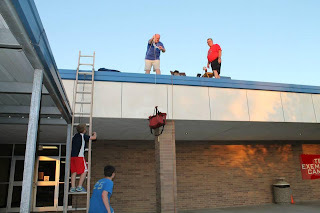 Beginning at 6:30pm the coaches began their ascent to the roof to get set up for the night. The boys and I went to make sure they got up on the roof and didn't need anything. We stayed for about an hour because people kept coming by to visit and bring them snacks, drinks, and a few Dairy Queen Blizzards. I called Hubs around 10:00pm to tell him good night and he said that they had so much snack food they could stay up there for about three days. 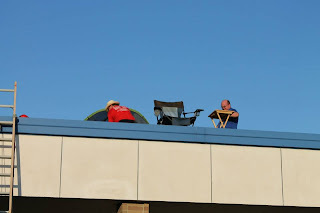 The students love it when these two camp out on the roof. There were so many pictures of them on Facebook from everyone that stopped by. This was the best turn out by far. Here they are going up. This was much easier than climbing up and down the ladder. When I brought the boys to school the next morning, they were still up there. They stay up there so the kids can see them and make a big deal about them coming down. Hubs said that people kept coming by until around 9:30 or so and that the police had stopped several times to check on them. The first time they stopped to see if wasn't senior high school students pulling a prank. Hubs told them they were almost seniors but of a different nature and that all of this was legit and everything was fine. Hubs said they also got a wake up honk at 2AM. 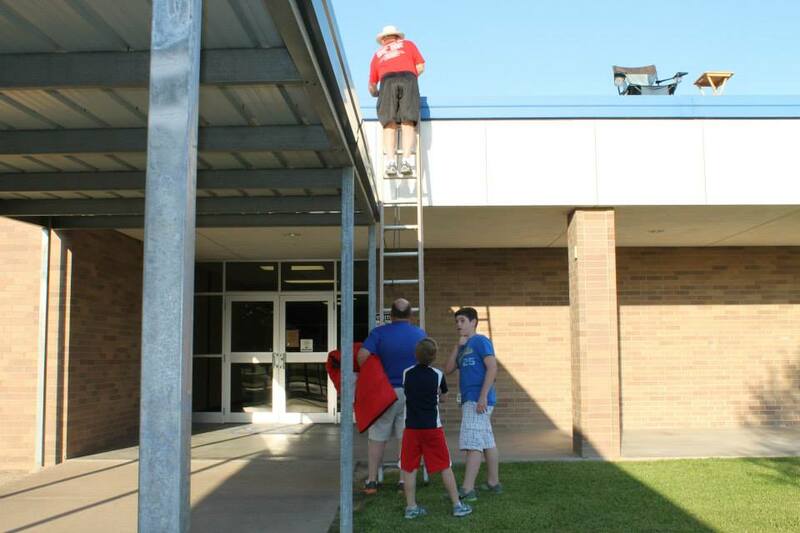 I love that my husband, other teachers, and even the entire school district do things like this all the time. It really shows they support the kids and really do care about them. I guess it's safe to say I'm now the mother of an 8th grader, a 3rd grader, and the wife of the technology coordinator at the high school. So here's to summer time! What a fun thing to do for the kids! very cool of them. bet the kids loved it! How cool that they do this! I remember when they did it last year, too, but I hadn't realized this was year #4! Congrats to Hubs in his new job!